Sophie has been residing in Singapore for over 11 years. After working in sports marketing and events, she started practising yoga to release stress from her job, as well as to stretch her muscles tightened from running. Over time, she developed a passion for yoga and decided to change her career path to become a yoga instructor. 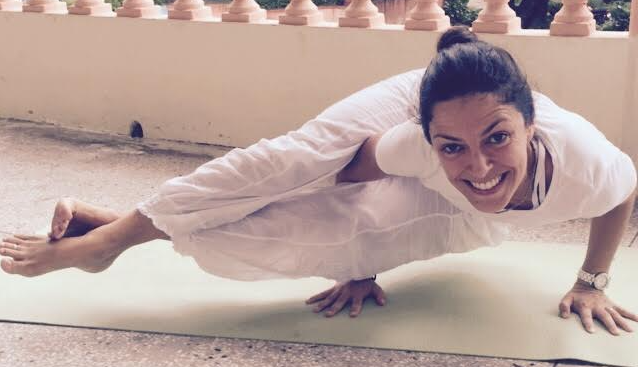 She is a registered 200-hour Hatha and Ashtanga, Pre & Post Natal, yoga teacher, accredited E-RYT® 200. She also spent a summer in the incredible state of Rishikesh, at the Parmarth Ashram, to learn about yoga philosophy and meditation. She completed Mindful Schools Levels 1 & 2 Certifications, and Reiki Level 3 & Master recently. Besides conducting yoga for adults, Sophie is also a certified Kids Yoga teacher and love introducing children to yoga. Being a mum of 3 daughters, she has always loved playing and spending time with kids, and naturally discovered Kids Yoga, and fell in love with it! Students say she is gentle, enthusiastic and energetic.. and so are her classes!